I knew nothing about it. I’d never even heard of it. Not until one sweaty July day in Malta, when a Dubliner friend of mine assured me that it was imperative that I attend the Galway Film Fleadh. She is a renowned Screenwriter and Script doctor, whose Storyworks Masterclass in Malta I had had the privilege of attending earlier that year. Whatever a “film fleed” was, to my mind it therefore seemed imperative that I should heed her advice. I was fortunate enough at the time to have saved enough money from previous jobs on film sets (Malta is a popular location for films, having serviced everything from the 1980s disaster Popeye, to blockbuster successes like Gladiator, Munich, and that very year’s Assassin’s Creed and The Promise) that I could afford an impromptu trip to a town I knew nothing about – in the name, I told myself, of the worthy pursuit of art, knowledge, film, and culture. It certainly had nothing to do with the Guinness and the Irish girls. The Fleadh – that is in fact pronounced “flah” I was quickly told – proved to be unlike anything I’d experienced before. I’d been to the Berlin Film Festival earlier that year, a massive and sometimes intimidating sprawl of Kinos and Palasts in a grey Communist-era block, and to the Valletta Film festival – open air screenings in the romantic baroque setting of Valletta. Galway, however, was something else. The Irish charm is a phenomenon oft written and sung about. It is a character all of its own. 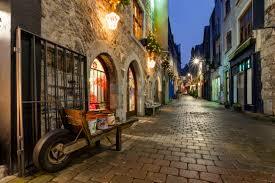 Certainly in Galway, a fishing village by tradition, every wayfaring stranger is not so for long. There’s a curiosity, sincere and genuine, in the way the Galwegians welcome a new face. If you’re “sound” and up for the “craic”, then you’re in good company. The two invariably involve drinking. And music. And storytelling. And the making of stories. Perhaps that’s why there’s an ever-growing, booming film industry on the Emerald Isle. The resourcefulness, hardiness, idealism and love of stories start at an early age, and the infrastructure is in place to support and foster talent. This was apparent at the Fleadh and in the manner in which the townsfolk spoke about it – with no hint of irony or cynicism. They really believe in their art. And such was the intimate setting of the festival that I found myself on many a late evening standing on the decks of The Rowing Club, overlooking the Corrib river, feeling like an attendee at a rather large house party instead of an international film festival. I was enchanted, and confessed to my friend that I was upset to be leaving. So she introduced me to faculty members of The Huston School at the National University of Ireland Galway, and I found myself applying almost instinctively for a spot on their MA in Screenwriting. I don’t believe in love at first sight – but this was the closest approximation I had to it. Galway had my heart. And my liver. The one tiny matter was of course – the money. The course only cost €6000, a minor fee compared to some of the more metropolitan courses in, for example, London or New York. But I didn’t have six grand. And then there was the accommodation – a notoriously difficult and expensive thing to secure in this little town of students, artists, writers and bartenders (all of which are most certainly not mutually exclusive). Cue the Malta Arts Scholarship. The Malta Arts Scholarships Scheme aims at providing more opportunities to support individuals who are exceptionally talented in the creation and/or promotion of professional work in the expressive arts. Theatre, music, dance, design, creative writing, film, the visual arts or any combination thereof shall be given priority. Now I cannot profess to be exceptionally talented, but I was certainly striving to be professional, so I applied. And was fortunate enough to be awarded the scholarship – to the sweet sweet tune of €10,000. And so with the Malta Arts Scholarship’s support I successfully enrolled at NUIG, and it proved to be the best decision I have ever made in my life. I’m indebted in many respects to the MAS, which is not merely an institution but a collaboration of individuals at all different levels, who select and then fund young people with aspirations much like myself. If I were writing a film script in which I am the protagonist, Galway would be the call to adventure, and the MAS would be my first mentor. MALTA DIARIES: What the hell is going on?